Food made with love naturally tastes better. And what more food that everyone had fun in preparing? Cooking healthy food with the whole family is probably one of the best things you can do together. Kids are naturally curious, and open to new ideas. Everything is an adventure. Healthy eating can start early. Yes, catch them when they are young. Encourage them and make it fun, so they will more likely stick to it. Well at this stage, everything is fun, so just enjoy the thrills and squeals they bring. But what exactly constitutes healthy eating? If you’re not sure how to start, take a look at the Health Promotion Board’s website and guidelines. For example, make sure your diet includes two servings of vegetables and two servings of fruit each day. You can consider stocking your pantry with the following superfoods too. antioxidant that keeps you from aging. has powerful anti-bacteria, anti-yeast and anti-virus properties. fiber, B vitamins, iron, zinc, and manganese. ● Soy: not only a source of protein, but may help lower cholesterol too! ● Sweet potatoes: loaded with fiber, protein, vitamin A, and vitamin C.
● Tea: has antioxidants and polyphenols. ● Wolfberries or Goji berries: we’ve been using them for ages in soups and dishes, and revere them as medicine. Little wonder as they yield over 14% protein, 21 essential minerals, and 18 amino acids. This includes more vitamin C than oranges and more beta-carotene than carrots. And one more you’ll be glad to add - dark chocolate! It’s rich in antioxidants and can help lower blood pressure. Look for chocolate with 60% or higher cocoa content - basically, the darker, the better. Darker versions also have lower fat and sugar content. Double win! With so many wonderful foods to add to our daily diet, why not get the family involved in learning about and preparing the food? 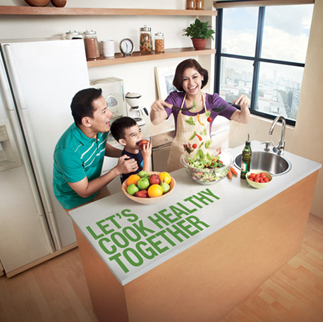 Take some photos while you’re at it, and join the “Let’s Cook Healthy Together” photo contest by the Health Promotion Board? Contest details are in my first post here. You could win the top prize of S$3,000 worth of Fairprice vouchers, along with cooking lessons for the family at Cookery Magic!